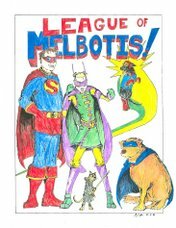 Yes, Leaguers, it's once again time for Melbotis Mailbag! The assembled might of League HQ is here to assist you in answering all of the questions which plague you. Do men identify with and/or aspire to be superheroes because of their innate desire to fix every problem they come across? Do you think a superhero that just listened to the problem and didn't jump right in with a solution or a fix would be considered a failure? -Natalie, who contrary to indications pointing otherwise is not bitter and jaded. Yet. Natalie, my dear, it sounds as if there's a subtext suggesting you're asking something completely different from the stated question, but since I'm not exactly clear on what that question is, I will take this on at face value. This is a little boring, but I think the answer to your first questions is: Yes. Dudes would like to be able to resolve problems easily and efficiently. This is not just ridding the world of crime, but also changing a tire, mowing the lawn and making cheeseburgers. Thus, the pneumatic wrench, the powered lawn mower and the gas grill. Moreover, I think a lot of people wish they had greater ability (ie: superhuman ability) to resolve problems they know they cannot solve as a flesh and blood mortal. Also, men like to wear tights. We don't talk about it much, but notice the pants on football players, the outfits on winter olympians and the speed suits on swimmers. In answer to your second question, I think you have to draw a clearer picture of "listening", and when that might be appropriate. For example, Batman probably isn't going to want to take some share and care time with a guy about to stab someone 47 times in a dark alleyway. Iron Man isn't going to hang about listening to why Kang the Conqueror should get to rule all of history. I do think that you'll find in Superman comics that The Man of Steel generally gives everybody an opportunity to put down their weapon and give up, or at least figure out what's going on in any situation before he starts slugging people. Superman knows who he is, and so does everyboy else, so you do get an opportunity for people to pause when he shows up to, say, foil a bank robbery. Superheroes are a largely reactive bunch, not terribly proactive. I don't think they'd necessarily be considered a failure for trying to stop and think out a situation or learn the motivation of a perpetrator. I do think if you read most comics, the characters are either placed into a position where they MUST immediately react to a clear and obvious threat. Many a comic story has been written regarding a superhero walking into a situation throwing punches first and asking questions later, only to learn that they may have taken the wrong side. Usually superhero teams will not just go running around slugging people, there usually is some discussion of appropriate plans of action with all viewpoints considered. For good examples of this, I suggest JLA and JSA comics. The next question was submitted by Steanso, no doubt, to see what I would be willing to print. At the risk of any potential future employer deciding this post makes me unfit for employment, here we go. Can you please explain the cause and the cure for the chafing, burning sensation that Jeff Wilson experiences in his crotch region whenever he participates in any extended outdoor activity? I have suggested that the sensation may be a biproduct of the hormones which the doctor has given him in anticipation of his gender reassignment surgery, but Jeff seems skeptical about this being at the root of his problem. For the good of Crackbass and of everyone who gets stuck watching him jiggle his junk, please help. Well, it was just a matter of time before the bi-curious antics of Steanso and CrackBass spilled over into LoM territory. I confess that neither my information nor the database at League HQ had any immediate answers. We do know that in the old west cowboys would use something called "crotch powder" to keep themselves from chafing from the hours and hours in the saddle. I assume this is merely talc. My suggestion, do not let anything go to chance. You must assist CrackBass in applying liberal amounts of baby powder and/ or Gold Bond Powder to the offending region. If that doesn't work, try some tough actin' Tinactin. Remember, Steanso, only you can make a difference. That's all for this evenings's mailbag! Keep those letters coming.